Why Can't I Get My Kids to Behave? Dating, Courting and Choosing a Mate...What Works? It’s difficult to imagine becoming grandparents when you are in the midst of parenting, at least we couldn’t. But the day will come when your first grandchild arrives and it is love at first sight, just as strong as when you had your kids, but different. How is it different? I remember when the nurse put our son into my arms after he was born; a part of me was elated and part of me was terrified. I (Carla) was his Mom! He would depend on me for everything. Could I do it? It was a little late to be asking that, but I think knowing you are going to become a mom while you are expecting and holding your baby and knowing you are a mom are two completely different things. When my son handed me his son, my first grandchild, I only felt elation because he wasn’t dependent on me for anything but love, and I had that to give in spades. We didn’t think we would be those grandparents who pulled out pictures of their grandchildren and gushed about them. I was wrong. We are this type of grandparents! We know you don’t want to hear about our grandchildren. You want to know what to do with your children’s grandparents! We can’t tell them what we think they should do in their grandparent role, but we can give you suggestions on how to handle them. 1. Do treat them with respect. They have earned it by raising you or your spouse. If you find yourself feeling disrespectful towards them, figure out the reason why and what you can do about it. Remember, how you treat someone is always a choice. 2. Do be kind. If you have something you would like to see them do differently, please find a kind way to tell them. They will listen to a kind tone and be more responsive to making the changes you are asking for. 3. Do remember their motivation is love. Please never forget that this is always true with both you and your children. They may not always act like it, and they may have times of thinking they are in control or that they are the parents, but they do love both you and your kids. 4. Do understand they do have good advice. Again, they did raise you or your spouse and you both turned out great, didn’t you? So they must have learned something along the way. If they give too much advice, ask them how they felt when their parents were dishing out advice when they were parenting. Neither of us wanted advice from our parents when we weren’t ready for it. We wanted to see if we could figure it out first. With our kids, we have told them regarding both their marriages and parenting if they want our advice they need to ask for it. Now granted, what we think may show on our faces and (I) Carla have been known to clap my hand over my mouth to keep from blurting something out while Joey looks the other way or leaves the room. But, we keep our mouths shut. We asked our daughter-in-law (knowing we were getting ready to write this blog) and she said we were very good about this. You don’t have to take their advice when you ask for it, but don’t criticize it or them because you did ask for it. 5. Do expect them to spend time with your kids. Don’t expect them to babysit. We do not babysit our grandkids. We do spend time with them when their parents are around and when they are not, but we never see that as babysitting. Since our first grandchild arrived, when we visit them (they are 4 hours away) we try to spend one evening with the family and then invite them to go on a date the next evening. Babysitting? No! Time to love on the grandkids? Yes! 6. Do include them. Take into consideration what they think and feel. Being grandparents is one of the delights of growing older. When your body is giving out and you wonder whether you have enough to retire on, the smiles of your grandchildren are a delight to the soul. We make a big deal out of birthdays and our daughter-in-law is great at letting us do so. Recently she was driving home from a visit to see her family and we were driving to Iowa from teaching near them. She went out of her way and we went out of our way to meet up at a gas station in the middle. We hugged the kids and asked them about their trip then we both got back in our vehicles and took off. The total amount of time of the visit was less than 15 minutes. We were so grateful to her for realizing we had missed seeing them during our time near them and for making the effort to let us get our hugs. 7. Do invite them to have a role in your child’s lives. Both you and they might need to define what that is going to look like. If you live close to each other it will look different than seeing them a couple times a year. 8. Do remember their motivation is love. It is worth repeating. Will they spoil them? Probably. If it gets out of hand, talk to them about it and try to find a middle ground. 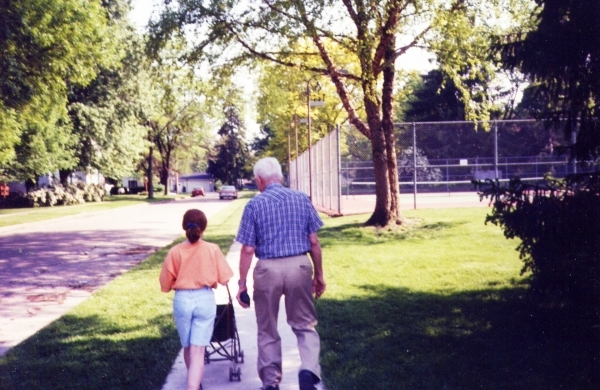 I had a strong, wonderful relationship with my grandparents. I chose the college I went to because it was near where they lived. Joey didn’t know his grandparents as his dad was orphaned at an early age and his maternal grandparents died when he was a young child. We were determined our children would know their grandparents and great-grandparents. Now we think of the legacy they left behind and of the one we want to leave behind. We want our grandchildren to remember we loved God and put Him first in all we did. Toward that end we find ways to leave this impression with them. What legacy do you want your parents to leave when they are no longer here? Why not talk to them about it? It is something you both can find ways to work on. Are Your Kids Mature Yet? Are Your Kids More Important to You Than Your Spouse? Dating, Courting and Choosing a Mate…What Works? Why Can’t I Get My Kids to Behave?